Tim was dating a woman, he’s always been “bi” but hasn’t really shared that with anyone. When he’s newly single he discovers a crush on his best friends brother that might be reciprocated. 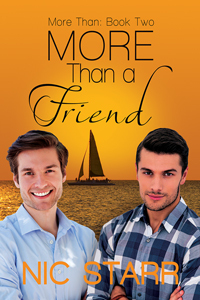 Scott and Tim begin dating but try to keep it under wraps because they don’t want to hurt Paul (the brother and BFF) in case things fall apart. This was a pretty predictable and bland GFY/OFY story. There was no discernible tension and only a bit of steam. Neither character stood out as particularly interesting and the plot didn’t have any fantastic twists. It’s a solid “best friend’s brother” romance and it was ok. This entry was posted in Adult (18+), Contemporary, m/m, Part of a series and tagged friends to lovers, OFY on October 7, 2015 by Morgan.